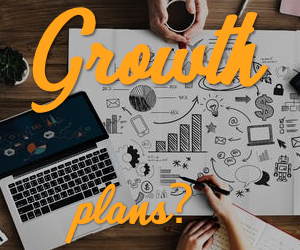 Opposition to the training is picking up momentum. Today, the National Trade Union Congress condemned the decision by the government to allow for the “Police Community” programme. The N.T.U.C.B. says it strongly objects to the abhorrent act which is likely to endanger the human rights record of Belize. The N.T.U.C.B. cites numerous reasons why the training should not be allowed to happen. First, there is the sale of arms to Guatemala by Israel. 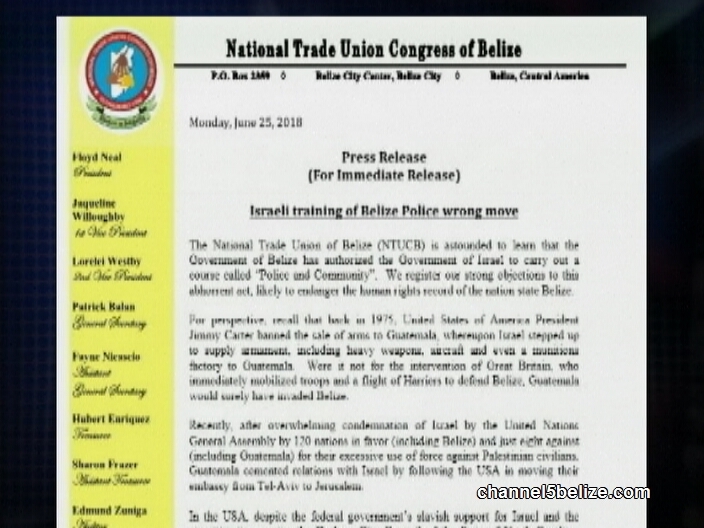 Second, the umbrella organization refers to the recent condemnation at the United Nations, including by Belize, of the excessive use of force against Palestinian civilians as well as Guatemala’s move to relocate its embassy from Tel-Aviv to Jerusalem. Third, the union recalls that in April, the Durham City Council of the State of North Carolina voted to ban training and exchanges between Durham’s Police Department and the Israeli military. The N.T.U.C.B. also called on G.O.B. 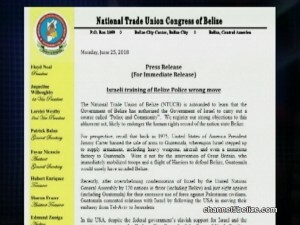 to end the madness saying, (Quote) “We should not allow Israel to be privy to any intelligence and national security information on Belize, which they may then pass on to Guatemala.” (Unquote) It recommends that Belize should look at its partners in the Commonwealth for training of the department. NTUCB is a wast of time. They are only talk talk and no action. Same with the chamber of commerse. They should learn from BNTU.